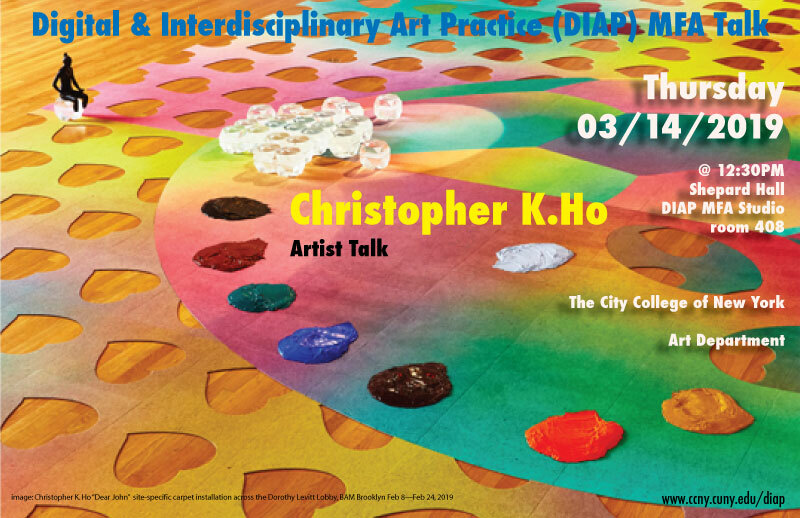 Christopher K. Ho will come to the DIAP MFA Program to speak about his work. His newest site-specific work, a carpet installation is on view from February 12 -24 2019 at BAM, Brooklyn. Christopher K. Ho (b. Hong Kong, 1974) is a conceptual artist based in New York, Hong Kong, and Telluride, Colorado, whose practice includes object-making, organizing, writing, and teaching. His multi-component projects address privilege, community, and capital, and draw equally from learned material about, and lived encounters with, power and otherness in an unevenly de-colonialized, increasingly networked world. He has exhibited at the Bronx Museum, Storm King Art Center, the Queens Museum, Cranbrook Art Museum, Para Site, MASS MoCA, and Socrates Sculpture Park, among other venues. He was included in the Incheon Biennial, the Chinese Biennial Beijing, and the Busan Biennial, and is currently showing a solo project for the Brooklyn Academy of Music. He received his BFA and BS from Cornell University and his MPhil from Columbia University.